Let's talk about grocery shopping on a budget. In our house, that's the only way we can do it. We are working very hard to finish paying off our credit card debt, which should finally be done in about a year and a half. Woo-hoo! In the mean time, we have $700 a month for groceries for our family of five. Last year we budgeted $600 a month, but this year we were able to raise that to $700. This gives me a little more breathing room, which is really nice and I am grateful for. This amount includes all household items, such as toilet paper and paper towels, as well as personal items such as toothpaste and mascara. It also includes feeding my stepdaughter, Adrienne, who visits us during any lengthy school break she has and for about half the summer. And lastly, it includes making nice meals for those we invite into our home, which happens pretty regularly. One thing this amount does not include is disposable diapers, which we have a different $50 per month budgeted for. For us, it has taken a long time to learn how to make a realistic grocery budget and then stick with it. When I say that $700 is our grocery budget, I mean it. We don't spend more than that. We do not have any money budgeted monthly for going out to eat. 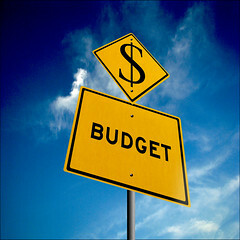 Occasionally, for a special occasion such as our anniversary, we will budget additional money for going to a restaurant. If we decide to get a Papa Murphy's pizza or a Starbuck's coffee with a friend, it gets subtracted out of our grocery money for the month. For a long time, I worked very hard at clipping coupons and shopping at several different stores in order to make our monthly budget. This took so much time and was a royal pain in my keester. But no more. Now I just shop at Winco! 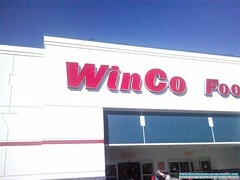 Next I heard about Winco from my friend Erin, a mother of five. Hmmm. Now this was advice to listen to, and now I rarely go anywhere else. Everett and we live in Mountlake Terrace. It is is a 20.8 mile round trip. Our Honda Pilot gets about 17 miles per gallon, probably even better for this trip because the majority of it is on I-5. This mean we use about 1.22 gallons of gas for this trip. Gas costs about $3.69 per gallon right now. This means that my trip to Winco in gas costs me about $4.50 each time. I go shopping never more than once a week and sometimes am able to stretch that to once every two weeks. So, the question is . . . Do we save enough money at Winco to justify the $4.50 cost of gas for each trip? The answer is a resounding yes! As my friend Erin put it, we save that much on oatmeal! First of all, I would spend the $4.50 for the time I save. I have become very savvy about good prices for the items we buy regularly. And the prices at Winco are comparable to the SALE prices that I would see at other grocery stores, if not better. Not only can I stick to our $700 grocery budget, but I can buy a lot more for that money. Store Size - It is a big store and it takes me quite a while to get through there with the three kiddos. but my friend Erin has. I buy all of my produce there. No Weekly Ad - There is no weekly ad, so I do some of my meal planning there at the store depending on what has the best price. For instance, I have seen chicken breasts for a great price one week and then for just a so-so price on another week. The so-so price still definitely competes with other grocery store prices. The magic is knowing the difference between the awesome price and the so-so price, looking for the awesome price each week and then buying a lot of chicken breasts that week. Length of drive - There is the cost of gas as well as the time spent driving. Bagging Your Own - Yep, you gotta bag your own groceries, but it's well worth the money saved. Doing Without - Now this could be seen as a downfall or an advantage, depending on your perspective. As I am shopping, I add up how much I am spending, which means that I weigh my produce and my bulk items. I know this seems like a lot of work and I guess it is, but I've grown used to it. I know there are people who snub this way of shopping and perhaps even think they are above it. I really hope they understand that this is the way millions of people in our country spend their money, not because they choose to but because they have to. That's their reality. That's my reality. I sincerely hope that those who are able to grocery shop without adding up how much they are spending realize that this is a luxury, and it is a luxury that many, many others cannot afford. If I didn't keep track of my spending this way, then there would be no more money for groceries at the end of the month or we would overwithdraw. I always leave the store without a few of the items that I was thinking about purchasing. This is how I stay on budget; by prioritizing needs and wants. Do I need toilet paper? Why yes I do! Do I need ice cream novelties? Not necessarily.